A New Years Eve Party Theme is always a popular choice to have when having a New Years Eve Party and a colour theme is always a good option. We have lots of New Years Eve Party Ideas for a Silver and Black theme which is both fun and elegant. Choose New Years Eve Decorations, New Years Eve Accessories such as New Year Hats and Glasses all to match your theme. We would love to hear if you are throwing a New Years Eve Party this year. With 2018 fast approaching we are busy sending out lots of New Years Eve Decorations. If you are throwing a New Years Eve Party either at home or if you are a restaurant or pub or bar looking to make an impression we have lots of fun and striking decorations for you to choose from. Having a New Years Eve theme is always popular and Silver and Black always looks stunning. 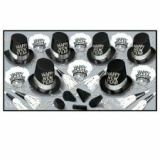 We have a great selection of Silver and Black New Years Eve party novelties to help get the festivities underway. Putting up New Year Banners is the ideal way to start to welcome your guests, select from amongst many a Metallic Happy New Year Fringe Banner, a Happy New Year disco Ball Banner or a Glittered Happy New Year Banner. A Silver Foil Happy New Year Cutout compliments these Happy New Year Banners perfectly as does Happy New Year Firework Stringers and a Happy New Year Hanging Decoration. Star Swirls in Black and Silver and Silver Glittered Star Stringed Decorations are a fantastic option and look really cool hung from door frames or on the wall. A Silver Shimmering Chandelier adds the real wow factor to your decorations and is something special to look at and a Star Paper Lantern looks very distinctive. Table Centrepieces also play a big part in continuing the Themed New Years Eve Party and our Star Gleam N Shape Centrepiece is impressive. Keeping to a Silver and Black theme for your New Years Party can also be extended to the New Years Eve Party Novelties. New Years Eve Packs are available in different sizes to suit your party and the Silver Legacy for 10 people and Showtime Silver for 100 people include lots of items including hats and tiaras compliment your theme perfectly as well as an Individual Filled Silver Party Box containing beads, a party popper, a streamer and rocket balloon which are great fun. Handing out News Years Eve Hats and New Years Eve Tiaras to your guests goes down really well and our Platinum Rush New Year Hat and Happy New Year Sparkling Glittered Tiara’s make an impact. Happy New Year Silver Glasses add to the theme and as the countdown to midnight begins hand out 2018 Glittered Plastic Glasses for a vibrant splash of colour. Now is the time to get ordering for a New Years Eve to remember. Are you throwing a New Years Eve Party this year?